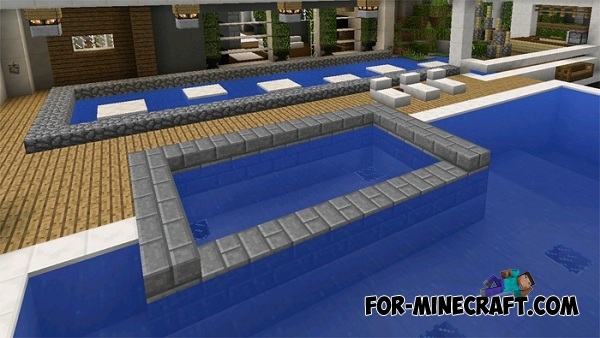 The Modern Mansion map contains a magnificent mansion with lots of different interiors in it. Near the house you will find a swimming pool, basketball court, and inside you will find a variety of options for modern mansion interiors. Redstone House map for MCPE 0.14.0Awesome map for Minecraft Pocket Edition 0.14 with advanced mechanical house that can perform many functions. Redstone Mansion map for Minecraft PE 0.13.0In the mansion you will see a button, pressure plates, detector rails, Redstone and all other components of the game. Vacation House map for Minecraft PE 0.11.XThis house is located on a mountain top. The house is very modern with white shades. Survival Mansion map for Minecraft PE 0.10.4Map takes us to the infinite world, where there is a huge mansion with monsters. Near the house is a river and a cave. the map is great, awesome and magnificent I can tell you put in a lot of effort in making that modern mansion!???? ?